So most of the sounds my three month old baby girl makes are like a cat….she gets mad, she yells (like you’ve pulled her tail! )…..she’s happy, she purrs (I’m serious, it sounds like she’s purring!) But lately she’s been trying to grab things more and a new sound has surfaced…the grunt. It’s kind of a constant grunt that she does while she’s trying to grab onto something, but it gets really loud if she’s becomes too frustrated. Today she was trying to grab her foot and she was getting very frustrated and nearly started throwing a fit. Instead she stopped, took a deep breath, and then when she relaxed she was able to focus and get her foot! It started me thinking of one of my struggles….trying too hard….on the wrong thing! Sometimes we don’t need to change the amount of effort we’re giving, we just need to change the focus of our efforts. One example of this was when I was giving birth to my second child. Between the combination of exhaustion and pain, I was not putting my focus in the right place. When it came time to push I was beginning to feel like I couldn’t do it. I pushed a few times and then let out a loud grunt and my attending doctor (whom I had just met the week prior, long story….) said, “Don’t yell, concentrate on pushing.” So I took a deep breath, visualized what I needed to do and where I needed to focus and then on the next contraction I pushed with only the thoughts of “Here she comes!”. And sure enough, my daughter came out on that push! All I had to do was push away the distractions, no matter how pressing they seemed (and we know that the pain and exhaustion of child-birth are pretty intense!) and focus on what I wanted to accomplish. Not only did I accomplish my goal much quicker but I also did not seem to have as much pain and fatigue, because I was not focused on it. Unfortunately I took the wrong route, I started staying up later, skipping my exercise, not taking any “breaks” and hurrying around like a chicken with its head cut off. Where did that get me? Well, not where I wanted to be, that’s for sure! Finally, today I (not purposely) fell asleep while feeding my baby and didn’t wake up til two hours later! At first I was panicked cause all I could think of was the lost time. But then as I realized how much better I felt with a little sleep on board, how much more clearly I could think, how much more efficiently I worked…and I started perking up. I could now focus on the job(s) at hand rather than how stressed/worried and tired I was. Once I stopped all my “grunting” and took a deep breath/break and refocused my energies I felt like things will all work out. Besides having the Lord to help me I need to remember to help myself! I will reach whatever end I am focused on, if I am focused on stress I will just create more of it. An awful never-ending cycle. If I focus on my goal(s) and take regular breaks to refocus and release tension I will be successful. Besides grunting is pretty annoying anyway! It’s 2012 and things are more convenient than ever. Throughout the North America, Asia, Australia, Europe and most large cities in South America and Africa…we can do one-stop shopping, we have technology they never dreamed of 50 years ago, you can out-source anything from websites to dog-walking…it’s really an incredible picture if you think about it. With all of this technology and all the services available, seemingly at your fingertips, you would think life would be easier, less complicated, that we would have more time…well, it’s a nice thought anyway. Nope, things are crazy and customs are forming where family life is becoming a lost tradition. We are SO involved in technology and SO busy with all that there is to do (or more likely that we feel we SHOULD do) that families are lowering on the priority list and consequently we’re losing them. Is it really very surprising that health issues have skyrocketed in the past 50 years? Can you imagine where we’ll be in the next 50? Personally, I don’t think we were put into families on accident. God created Adam and Eve, to be husband and wife, and they were commanded to multiply and replenish the earth, to have families! I truly believe that families are sacred assignments from God and not to be taken lightly. At the same time, we have to do other things in order to support our families and take care of their needs, and ours as well. Ideally, I feel it is best when the father is the major breadwinner of the family and the mother is at home. If need be she can work part-time from home, but her primary duty is in nurturing and caring for her family. Unfortunately, it just isn’t possible for all families to have a “stay-at-home” mom. There are single moms and with the economy today, at times the mother must work outside the home. The only thing I would say in this case is that make sure that it is a necessity for the mother to be working outside the home, and not simply a means to create a certain desired lifestyle. If it is a necessity that the mother work outside the home, just do the very best you can to make sure that family is the priority. How do we create a balance when so many commitments and activities and needs are pulling us in so many different directions? Firstly, know you’re priorities. God, Spouse, Children, Work, Service Commitments, Hobbies. I have found that when I put my Heavenly Father first, everything just works out better. Is life perfect? Does everything run smoothly all of the time? Am I free of hard-times, worries, anxieties, and stress? Of course not, I’m human and I’m living in an imperfect world, things will be hard at times and maybe even for a long time. However, with God first, I am much better equipped to face these hard-times and insecurities; I know better what to do and I am much more at peace. Scripture, prayer, and seeking for His guidance at all times, and as my top priority, helps me find the next priority, and how to accomplish it, much more easily. My spouse comes next. This is tricky at times, isn’t it? Spouses are adults, so I think sometimes we tend to let them fend for themselves a bit more than we should, simply because they are capable. Capable yes, but we are created to “be one” and a “helpmeet”, that means we are equals but that our primary focus should be on how we can help our spouse and make them happy. Does this mean they become above our health and well-being? How can they drink from an empty glass? Of course not, part of being married is realizing that your spouse is human and that there will be times of give and take that is not equal. Just remember that if you are focused on fulfilling their needs and desires and they are focused on fulfilling yours, then not only will all the needs be met but you will get an increase of joy because you are serving. Now, here come the children. Let’s please remember that children need their physical needs met but they also need guidance, a good example, a listening ear, and lots of love. These emotional needs are best met when we are “present”. That means not just physically there with our kids, but tuned in, emotionally, spiritually, and mentally “there” as well. Also, let us not forget that giving physical things (treats, toys, trips, etc.) and fulfilling every want in place of these emotional needs will only lead to more problems, not solutions. O.K. let all the rest take their place, Work, Service, and Hobbies. Work is important. It helps us meet physical needs but also (ideally) will help us reach our potential in other arenas and expertise. It can be a very rewarding experience, but should not be a consuming experience. Create a schedule, create limits for employees/employers/clients; be flexible but not a doormat. When you are physically done working, try your best to be “present” with your family, the work will always be there when you get back to it, but you can miss a once-in-a-lifetime experience with your family just by not being “there” with them. Yes, you need a financial way to sustain yourself and family, but not at the expense of your health and well-being. The same goes with Service and Hobbies. If your family feels that they come second to other people, the t.v., games, the computer, exercise or any other number of activities then it’s time to make some changes. The same applies here as for work, set a schedule, create limits for yourself and other people that may ask of your time. Remember, creating balance is not like putting all your plates on a board and balancing it on your head. 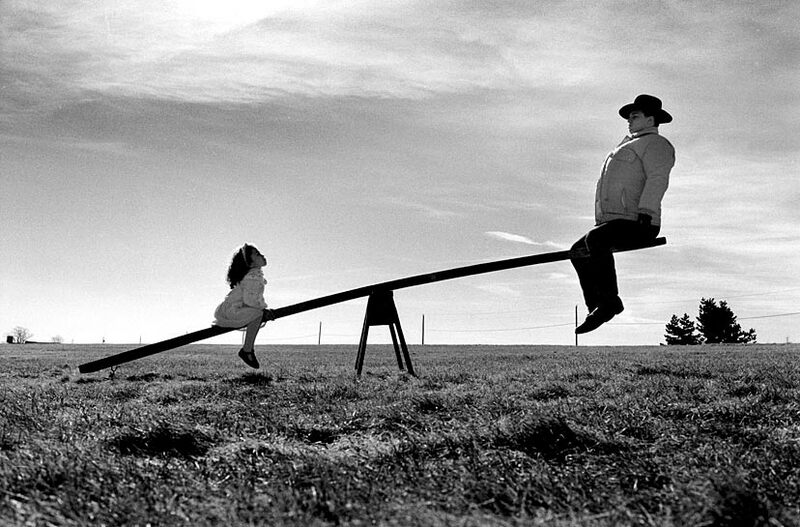 It is much more like a teeter-totter (see-saw). When you are giving time and effort to one thing (God, Spouse, Kids, etc.) you cannot simultaneously give time to another. Yes, yes, multitasking is possible but in reality you can really only FOCUS on one thing at a time. That means in order for balance to be met you will have give and take happening at all times. If you have a project at work that is going to create more hours and efforts in that direction, then make sure your family is aware of this, give them a reasonable time-line, and stick to it and take some extra time for them when you’re finished with the project. If you have a sick spouse or child, or one that has a particular need that may take away from other obligations, again this is a time when other things may not get the attention they deserve, but make sure that explanation is given and that you create some special time for the other needs when opportunity allows. Also, in terms of well-being and efficiency, too much focus on one thing for too long is not healthy or effective. Take breaks, even during times when you have a project or particular commitment that requires extra efforts, make sure you are taking care of your health and if there is enough left over of you during that “marathon of efforts” give some time for your family. What are your best methods for creating balance in your life? What do you do when you feel you’re unbalanced?